Here's my summary of the key events overnight that affect New Zealand, with news there are no surprises from the US central bank. The US Federal Reserve delivered its well-signaled +0.25% rate increase today as expected. It is now 1.00% at the upper bound. Their dot plot guidance now shows they expect three increases in 2017, including today's one. They plot another three rises in 2018, and more in 2019 taking their policy rate then to 3%. They are showing heightened concern about inflation risks, a sudden, new exposure for policy makers who have been more concerned about employment levels for the past decade. The Fed has yet to start winding back the quantitative easing money they have poured into financial markets, however. Recall, American QE ended in October 2014 after the tap added US$4.5 tln into the system over six years, or an average rate of 4.4% of annual GDP over that time. American consumer inflation is now up to +2.7% pa in February according to data out today. That puts the 'real' official benchmark rate deep in negative territory. It is also undermining real earnings growth. Across the Atlantic the Dutch are voting in a key election. The early turnout is sharply higher than their last election in 2012 as immigration and economy dominate contest. Results will start to be known in mid afternoon New Zealand time, although it could be a cliffhanger. In Chile, all the other signatories of the TPP met earlier today and vowed to push ahead without the US. In Australia, analysts are warning that 'property investors' face significant interest rate risk in the immediate future. While rate premiums on loans to them and interest-only loans have started, JP Morgan analysts say that much more is to come, perhaps as much as 3% more. Sydney is where the largest risk exists. And staying in Australia, ANZ and Westpac have both entered into enforceable undertakings with the Australian Securities and Investments Commission (ASIC) following the regulator's probe into spot foreign exchange trading between January 2008 and June 2013. ANZ says it accepts aspects of its supervision and monitoring of the spot FX business weren't good enough, has taken responsibility and apologises. Interestingly ASIC's statement thanks NZ's FMA, among others, for its assistance in dealing with both banks. In New York, the UST 10yr yield slipped to 2.58% before the announcement, and then fell to 2.54%. At the same time investment grade CDS spreads narrowed sharply. Oil prices are up US$1 today and now just over US$48.50 for the US benchmark, while the Brent benchmark is just over US$51.50 a barrel. The gold price is also up +US$6 on the Fed decision to US$1,210/oz. And the New Zealand dollar was marginally firmer at 69.6 USc perior to the Fed announcement, and then jumped to over 70 USc. On the cross rates the Kiwi dollar is at 91.5 AU¢, and against the euro is at 65.5 euro cents. The NZ TWI-5 index at 75.4.
the markets did not dip on the rate rise which is telling me that they had priced in. Why? Benchmark interest rates fell today following the Fed statement. watching yellen speak this morning the tickers did not move, normally there is a reaction to what she says, so to my mind this has been priced in well advanced as people knew it was coming. The move was long since telegraphed. I would expect a reaction to no rate increase. Mortgage Interest rates in NZ will continue to trend higher, regardless. The political climate is accommodative to rates inching upwards now, which will be exploited. Also, no signs of any customer/borrower backlash so rates will keep slowly, stealthily climbing. Floating at 6.5 at least, by end of 2017. If TPP is going ahead without US then i hope we are dropping the Mickey Mouse extension of copyright protection to life of author+70 years. Perhaps the sytemic risk caused by lending to property investors is finally being recognised, and banks will need to provide higher risk weights to such lending. Perhaps in its review of capital requirements, the RBNZ will make a distinction in its risk weighting requirements between lending for investors and lending for owner occupiers. Perhaps the RBNZ might actually take some actions to contain rampant credit growth driven by property investors. I wonder what fireworks will occur when the Fed has higher rates than our OCR. @ Brock , It will take a long time for that to happen . If the Fed rate is 1% and it increases by 1% the cost of borrowing goes up by 100% with devastating effects . The article above says they are expecting three more raises this year and a further three in 2018. If that comes to fruition they are at parity with us by the end of this year. American consumer inflation is now up to +2.7% pa in February according to data out today. That puts the 'real' official benchmark rate deep in negative territory. Outside of energy, rising rent prices continue to be the primary plague upon consumer finances. The rent component of the CPI rose 4.2%, the sixteenth time over the past eighteen months where the annual change was 4% or more (and the remaining two months were just less than 4%). At the peak of the housing bubble, rental prices according to the CPI’s version of them increased at a better than 4% for a total of nineteen months to early 2008. In the early 2000’s, it was for twenty-five. The difference between those prior periods and the current one is wages. Now, unlike before, wages and earnings are growing at about half the rate that rents are. This disparity is usually only found during periods of recession, a painful reminder of the underlying weakness in the real economy and the imbalances that remain. If we subtract the contributions of rental prices from the CPI, in the services category, we find first no trace at all of the four QE’s and six years of ZIRP, leaving instead the same underwhelming economic trend exhibited almost everywhere else outside the unemployment rate. There is a conspicuous lack of price momentum at the baseline. The Fed is quite determined to escape the liquidity trap. The previous increase had almost no impact despite the move from 0 to 0.25%. I suspect there will be a marginal effect from this increase which will pave the way for another increase. On ground level car finance is still dirt cheap and people in the US that can afford their cheap houses aren't having problems with their mortgages. Then the rate increase only hit those that the purchase from now on due to 15 and 30 year fixed mortgages in the US. So if you arbitrarily remove the categories that have gone up in price from the CPI, you amazingly discover the modified CPI hasnt gone up! When China is apparently trying to cut back on debt... and the US is making debt more expensive ... its hard to see where they think growth is going to come from. Debt growth is what has been holding the world economy together... Higher rates will only push commodity prices lower. It's the reverse they're stuck in a liquidity trap and they're trying to fight there way out. What they've long since needed to do was write of a lot of the debt, but when you have 0% interest there's no pressure on debt servicing to weed out the broken companies. The zombie companies that are taking out 0% or low interest debt need to be put out of their misery. Expect pain and bubbles to burst along the way. You're right the value of bonds in retirement funds will decrease. On the upside retirement funds will be able to purchase higher interest bonds. Just stick with 1 year fixed and you can bet your house on it. Not all price increases are created equal. 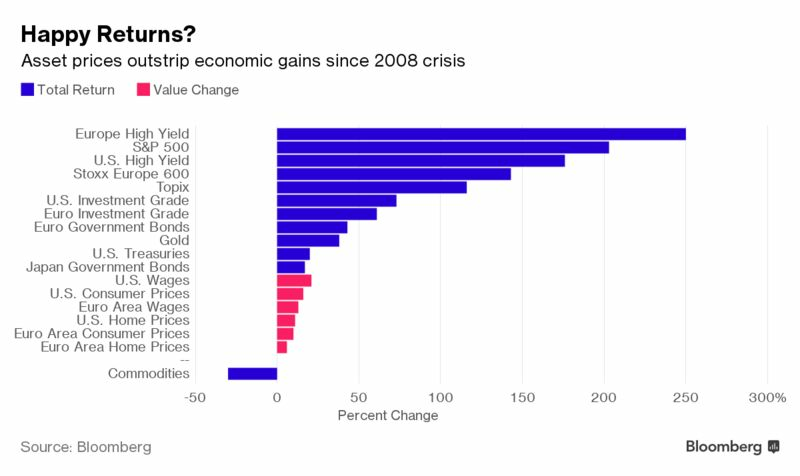 Goldman Sachs Group Inc. raises questions about the success of the efforts by the Federal Reserve and its peers to spark inflation in the wider economy with a chart showing what’s happened with prices in the largest developed economies since the start of 2009. W.R.T. the Dutch election , even if Geert Wilders gets most votes , he is unlikely to be able to form a Government , because all the centre- left parties are unwilling to work with him . Its interesting how Europe has swung to the right , the baby boomers and generations following them have never lived through a war and its depravations , and have only seen European economies at their zenith . People who were born in 1939 are almost octanagerians , with many living alone in frail-care facilities with little or no influence in politics . My take is that many are Western Europeans fed up with the problems with migrants from eastern and southern Europe and the middle east , who have failed to assimilate , are often unemployed and a burden on social welfare , and are responsible for petty crime and gang related violence . Not to mention being fed up at having been told they must stop serving pork in school lunches . It's hardly suprising that nationalism and the support for right wing parties is on the rise in Western Europe. You only have to look at Merkel's and the EU's misguided, altruistic warm fuzzy approach in letting hundreds of thousands of Muslims into the continent. I bet more countries will want referendums on leaving the EU in the next few years. GDP is tracking very low. Measures of labor compensation are not threatening to boost inflation any time fast. The consumer is not picking up very much. Fiscal policy, we don't know what's going to happen with Donald Trump. And yet, you have to raise rates now. So what is the -- what is the motivation here? The economy is so far from your forecast in terms of GDP, why does the Fed have to move now? What does this signal, then, about the rest of the year? I'm all for them throwing all the debt into a fire and writing it off. There's risk of economic and political issues arising. No doubt Trump will start a war as soon as anything happens to distract the population. Sorry Winnie...wont be voting for you.